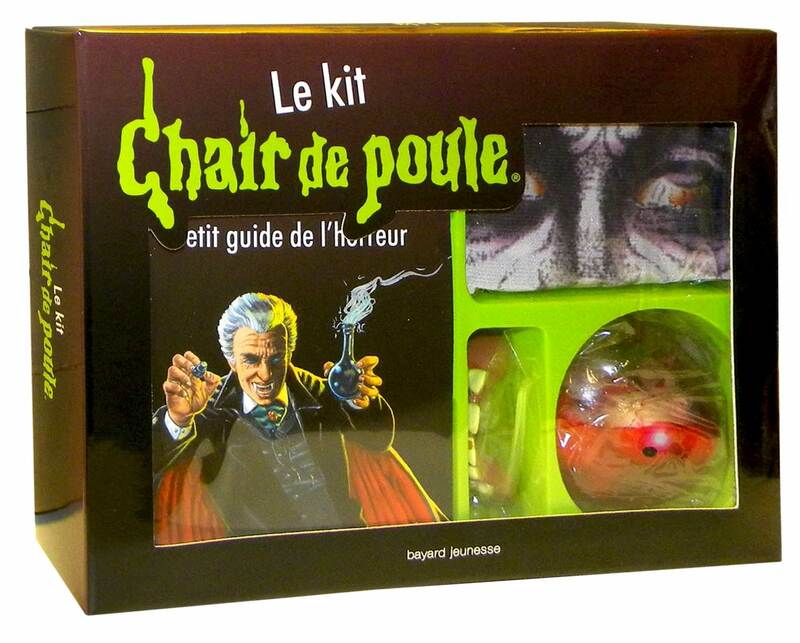 It’s October and the Halloween season is the perfect time to talk about Goosebumps, or Chaire de poule (literally chicken skin) as it’s known in francophone regions. 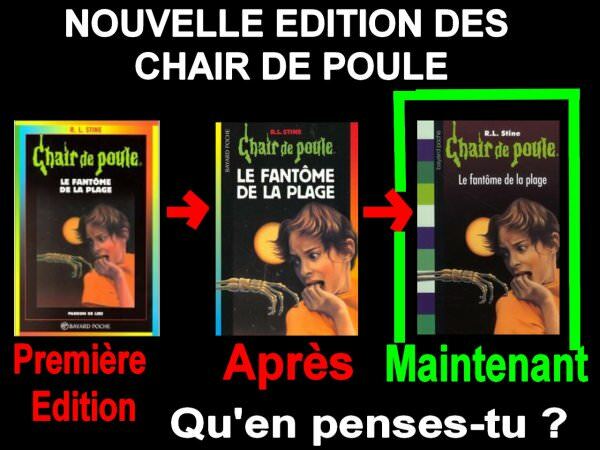 And that’s exactly what I want to talk about the different editions that the French versions that this book series got in both France and in Quebec Canada. 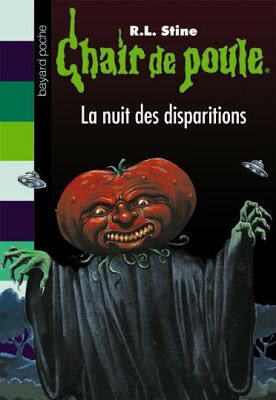 The French Edition was published and translated by Bayard Poche and printed 74 books. 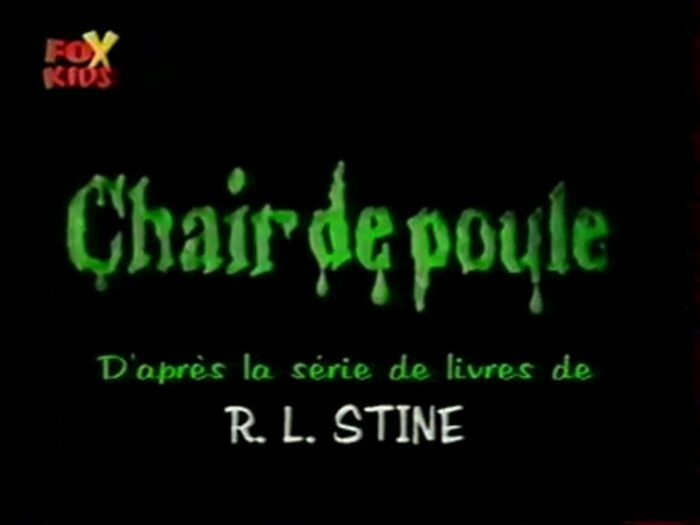 The logo is mostly the same slime font only with the Chair de poule name while the covers are entirely different. They are worse and nowhere near as iconic as the Tim Jacobus’ covers but they do succeed in looking far creepier and scarier that you’d expect them in another book series like Scary Stories to Tell in the Dark. Some even had different covers when they accidentally made some far spookier than they intended and had to get new covers. They also changed the name of the books quite often, The Haunted Mask 2 was renamed “The Return of the Haunted Mask” as an example which I think is a better name than adding just a number at the end. 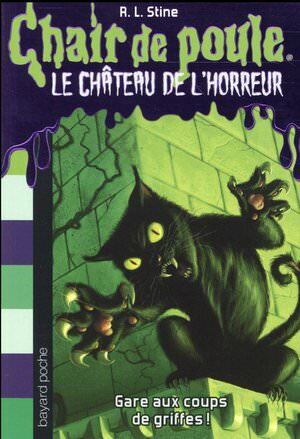 The covers are quite iconic in France as reprints have kept the artwork instead of re-using the official covers for the most part even if some newer reprints and newer series of Goosebumps books do indeed use the official artwork. And even then they still make them their own by changing the rest of the book even if the artwork is the same. 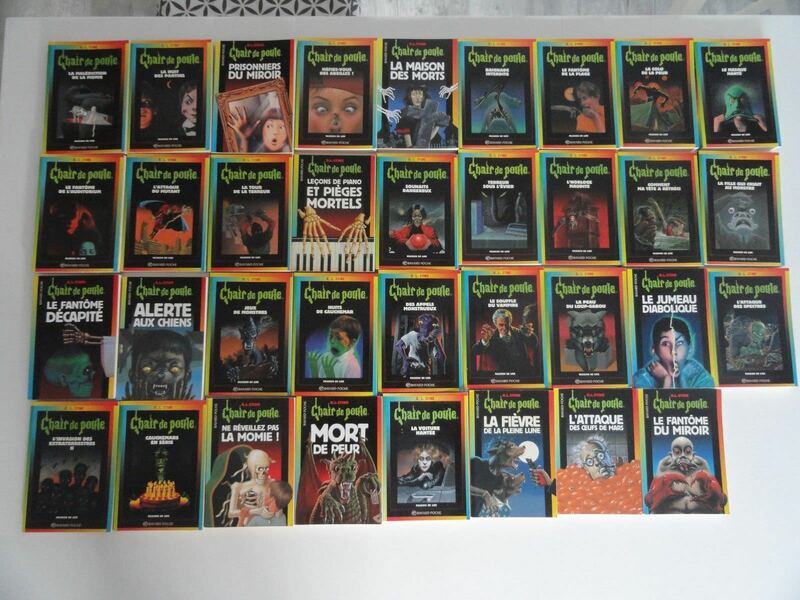 Since the French edition was 74 books because many Goosebumps Series 2000 books were actually printed as part of the series. Similarly Goosebumps did the same during reprints. I’d love to feature all the different covers just because of how odd they are, but this is already an image heavy post and I can’t say the covers are amazingly good either to justify it but at least here is a small collection of the books. Some of the books changed name as I mentioned but remained somewhat similar to the American titles. Others however have entirely different names for example Attack of the Jack-O-Lanterns is called the night if disappearances and that’s not even the strangest title change. 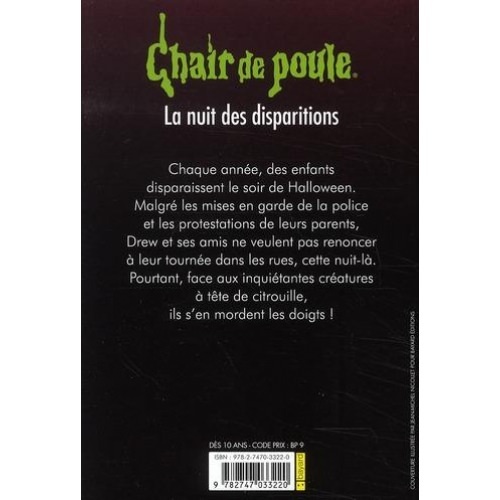 Some books featured edits but La nuit des disparitions featured the biggest change as most of the story is altered with new text to fit the title and that kids are disappearing. It’s speculated that it was because the original story was too scary with references to cannibalism and eating children, this meant that plenty of content was cut, new content written and an entire new ending was where they go to the police and no one believes them with no twilight zone twist in the end. Now let’s get to the Canadian French editions for Quebecois which were published and handled by Héritage Jeunesse. The covers are exactly the same and most of the titles are just direct translations of the American ones. 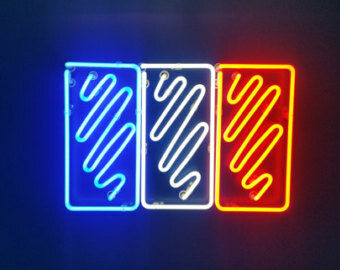 Others are very similar to the French versions however like Night of the Living Dummy becoming Le Pantin Diabolique which is closer to Le Pantin Malefique. Apparently there are many more changes in the Canadian versions but based on what I was able to find it’s a more direct translation except for names of characters and anglicisms being adapted since Quebec has laws to keep the French language intact. 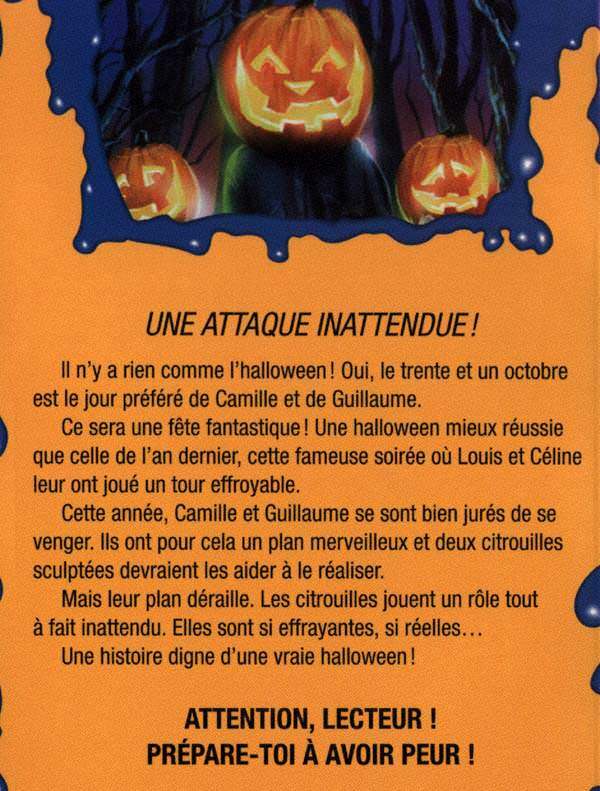 Having not read either version I can only go by what I’ve been able to research and at least Attack of the Jack-O-Lanterns seems pretty accurate when compared to the French version. You can check it out by reading the synopsis here and the previous one. 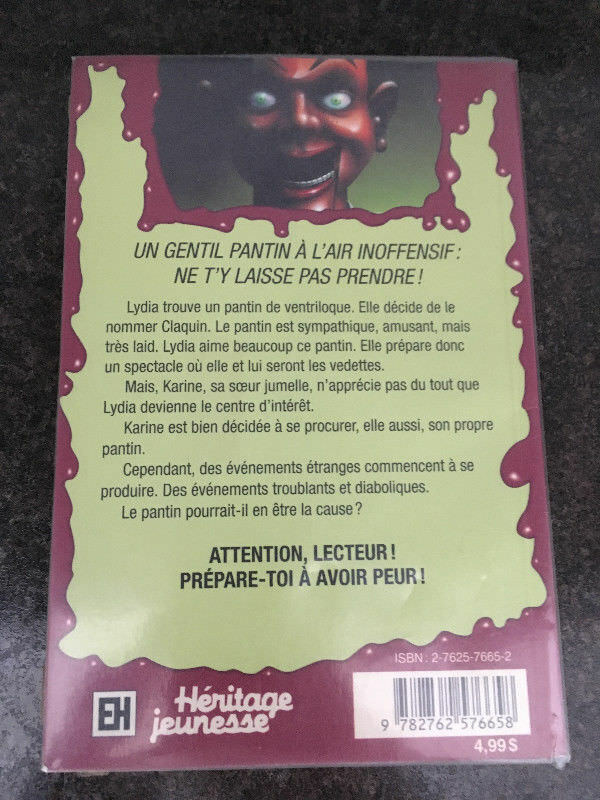 The French versions seem to have gotten around Canada though as you can find them if you search for them in auction sites easily. 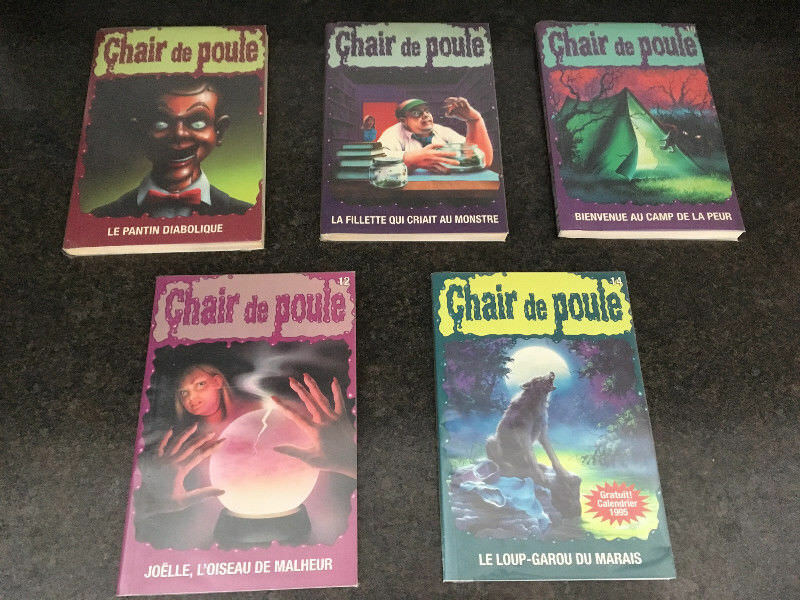 Even the Choose your own Adventure Give yourself Goosebumps series were translated as Chair de poule Extra” Mostly keeping the same cover art but changing the style completely. 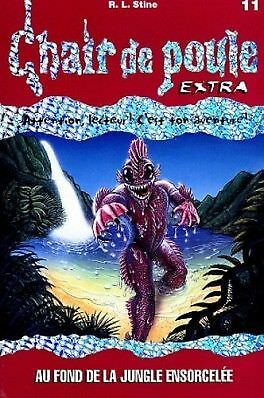 It’s a bit hard to find information on French Goosebumps in both France and Canada from the classic era. 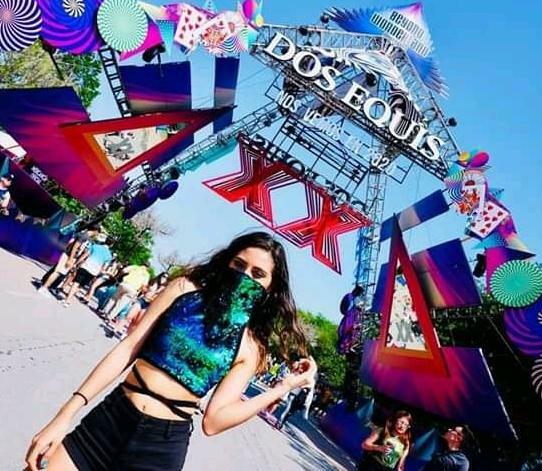 Now it seems that Scholastic has a more streamlined process with keeping things more faithful to the originals not only in content but in presentation but even with completely different artwork the books became a hit. Just look at this generic halloween kit that is goosebumps themed. The TV show actually has two different French dubs one being for Quebecois and the other for France. I can’t really judge either one with the few clips I found but I’m sure depending on which one you grew up with you’d prefer that one or in this case which one you’re studying.